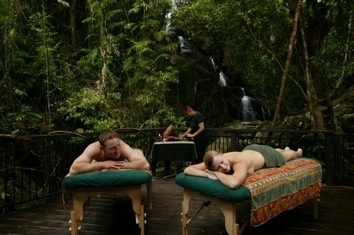 Daintree Eco Lodge & Spa combines nature, culture & nurture in a true rainforest experience. Nestled in a valley, offering quality accommodation, cuisine with a native twist, authentic Aboriginal culture, and the world-acclaimed spa. Daintree Eco Lodge & Spa offers pure indulgence in a sustainable, eco friendly environment. The perfect base to discover the essence of Tropical North Queensland, exploring the majestic Daintree River, ancient rainforest and Great Barrier Reef. Known as the 'most pampering Ecolodge in the world' with only 15 rainforest villas nestled in the rainforest all combine to present true experiential travel. The villas are set in different levels of the rainforest - live in and experience differing aspects of the rainforest from the floor to the canopy, and are designed to be an environmentally sensitive means of experiencing the rainforest - the sounds, aromas, textures and sights ! Fully micro screened balcony, Ensuite bathroom, TV, CD Player, Free in-house movies, Original Aboriginal Art, Tea & coffee making facilities, Mini-bar Direct dial telephone, Air-conditioning & ceiling fan, Wireless internet access. Free WiFi in all public areas, telephone messaging, local transport options, Conference facilities for small groups. All rates are per room for up to two (2) adults. One (1) extra guest can be accommodated at an additional $80 per night or $240 for 3 nights. Drive north from Cairns towards Port Douglas/Mossman/Wonga and then Daintree. Follow sign posts. Daintree Eco Lodge & Spa offers self guided walks free of charge. Guests can also choose from tailor made tours including dawn and dusk river cruises, Aboriginal culture tours and experiences, day trips for snorkeling and diving on the Great Barrier Reef as well as an array of birdwatching, fishing, bush walks, horseriding and thrilling 4WD safaris. Cruise the majestic Daintree River with Mangrove Adventures, experience the ambiance as dusk settles and you witness the transition from day-time to nocturnal habitat. Watch the entire environment change, the effect is inspiring, ancient, exciting, and yet peaceful. Beach Stone Curlew. Half and full day birdwatching safaris throughout the Daintree and adjacent regions.